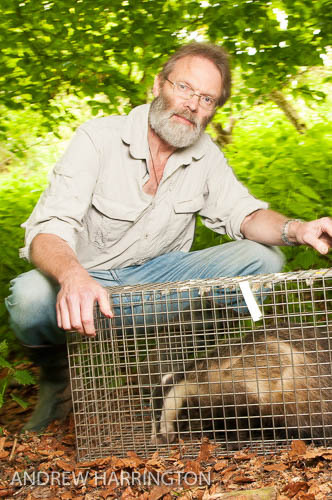 How do we study badgers? Since 1987, we have undertaken 3-4 systematic trap – handle/sample – release sessions each year. Thus far, we have followed the births deaths and mating patterns of over 1750 badgers, charting their life-histories against outbreaks of disease, changes in habitat and weather, and variability in their food supply. This has yielded one of the most detailed and enduring databases for any carnivore species in the world. 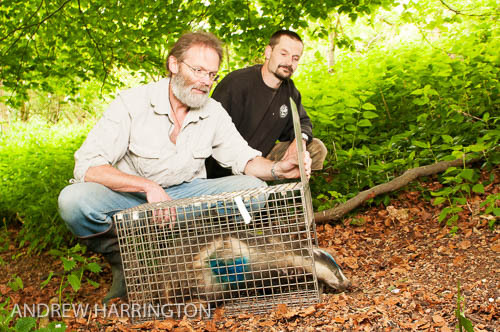 We catch badgers in specially designed traps, set over-night and checked each morning. Captured animals are then sedated to enable us to weigh, measure and sample them. Any animal new to our regime is given a unique identifying tattoo (usually as a cub), allowing us to track life-histories individually thereafter. Crucially, we take a small blood sample, which provides DNA for a host of studies (see below), as well as supporting studies on hormones, diseases and immunological responses. A proportion of badgers are also occasionally fitted with tracking devices (see below) to enable us to follow their movement patterns. This handling takes about 15 minutes, after which badgers are monitored in a dark room for around 3 hours as they fully awaken from sedation. We then return them to their site of capture, first daubing each individual with a temporary coloured (sheep) marker. This allows us to identify which badgers have already been caught during our 12 day session, because many individuals are tempted to get re-caught on multiple occasions, clearly unperturbed by the experience. Indeed, ensuring the welfare of these study animals is vital to us, not only from an ethical standpoint, but because to disrupt their natural behaviour would be counter-productive for our studies. To these ends we have produced a wealth of studies refining sedation protocols and reporting ways to ensure calm responses to capture. 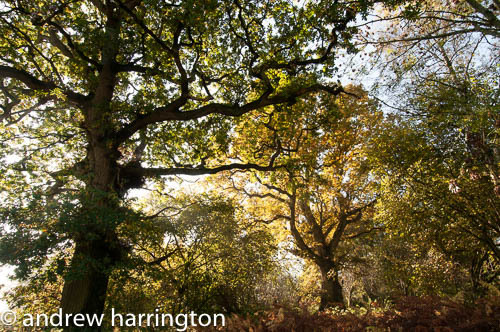 To these ends, we have pioneered blood tests for measuring physiological stress that have proved useful not only for badgers, but also for other wildlife, and even to monitor the stress levels of athletes and executives.